Let me start by saying that I don’t intend for this post to provide comprehensive instructions for how to pack a bicycle for shipping. The internet abounds with videos that serve that purpose and that were created by people more competent than I. Instead, this post is meant to show a few pictures of what ended up consuming most of a Sunday and to share a few tips that I didn’t find elsewhere (although I’m certain I’m not the first to think of them). Tip #1: Do it yourself. There’s a lot to be said for the convenience of putting someone else in charge of disassembling, packing, and shipping your bikes before your tour. But that convenience comes at a cost. I’ve talked to bike shops that charge anywhere from $40 to $100 to pack a bike, and that excludes shipping. That’s a lot of money that could otherwise be spent splurging on a nice meal or a motel on a rainy night on our tour. Toss in the sense of accomplishment and self-sufficiency and some other lovely intangibles, and doing it yourself is definitely worth it. Tip #3: Use www.shipbikes.com. I don’t know how they do it. It doesn’t make sense. If I go to the FedEx website and enter my bike package details, I am quoted a price of roughly $155 (UPS and USPS give similar quotes). When I go to ShipBikes (which uses FedEx) and enter the same information, the quoted price is roughly $60. It’s not a scam; you print out a FedEx label and drop your bike off at a FedEx location. But I have no idea how they’re making it work. (Tangential) Tip #4: Bike stands are amazing. This isn’t strictly related to packing your bike for a tour, but it merits mentioning. I received a bike stand as a gift a year and a half ago, and it’s one of my favorite possessions. Suddenly, basic maintenance became a breeze and slightly more complicated maintenance (that includes the use of both hands, pedaling, or anything that is inconvenient on an upside-down bike) became much more feasible. 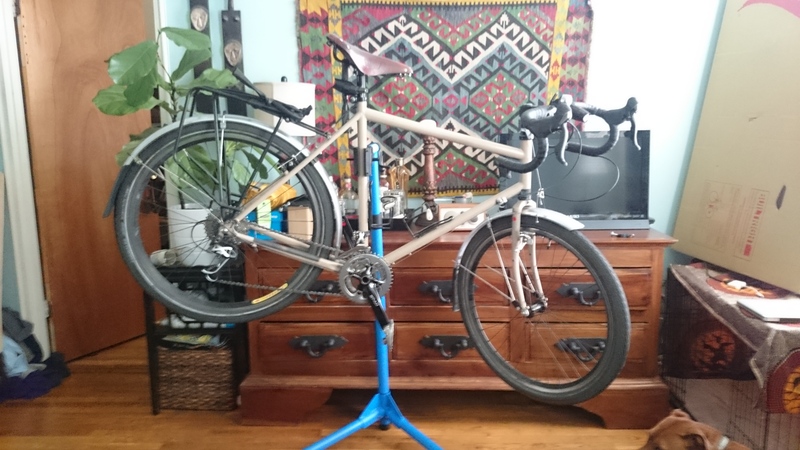 I’ve learned tons about bike maintenance since I received the stand, which has saved me lots of money and also increased my confidence in my ability to perform on-the-road repairs on the tour. The stand folds up and lives in a small corner of our closet, so it’s worth the storage space (even in our 319 sq ft. apartment). Tip #5: Protect that pesky rear derailleur. If someone came up to me and said, “Ted, I’m going to give you a ton of money on the condition that you only use it for bike-related purchases,” I would a) do everything in my power to build an ongoing relationship with that person, and b) buy a Rolhoff Speedhub. The rear derailleur is one of the most critical aspects of a well-functioning bike, and it is also the most vulnerable to damage. When we went on our honeymoon tour down the Oregon coast, the derailleur on my LHT was bent slightly inward during shipping. It wasn’t impossible or even difficult to ride, but the shifting was off just enough to make it incredibly frustrating. I don’t want to deal with that again. When I packed up my bike, I removed the chain from the rear derailleur by taking out the bottom jockey wheel. Then I removed the derailleur from the frame (leaving the cable attached) and wrapped it in bubble wrap. Then, in order to make it as safe as possible, I rested the wrapped derailleur on the drive-side chainstay before I zip tied the front wheel to the frame, which held it nicely in place between the two wheels (you can see the result in the image above). Hopefully this minimizes the risk of damage during shipping. Tip #6: Shortcuts can veer long. This goes in the “obvious observations” file. Bike boxes are designed to fit the bike in the smallest possible box to keep shipping costs down. Thus, it’s tough to fit your bike in the bike box with all of its cumbersome accessories attached to the frame. I know this. I knew this. But I still tried to pack my bike without taking off my rear rack and rear fender. That was a bad decision that led to unnecessary stress and annoyance. Take all of your accessories off and pack them in after the bike is already in its box. I got so good at maneuvering the boxed bikes on top of a longboard that I almost regret not having more bikes to pack. Almost. Tip #7: Do what you can, but it all comes down to hope. 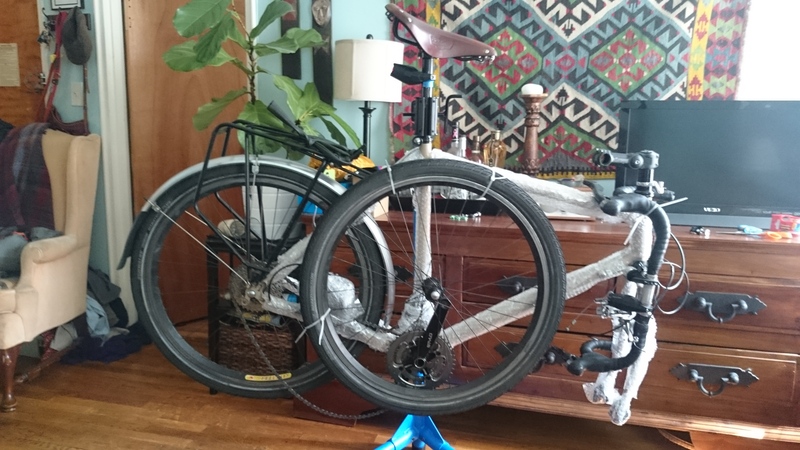 Once the bike was in its box, I stuffed the empty space with newspapers to pad the bike and minimize the amount the bike could move around inside the box. I also wrapped accessories (e.g., water bottle cages) and put them in the box with the bike. 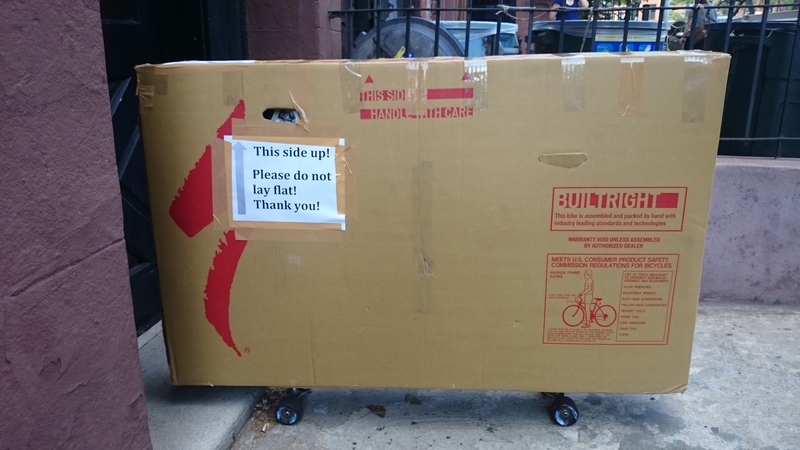 Then I taped signs to the both sides of the box imploring the FedEx people to please treat my bike nicely. And it will probably be fine. But there’s always the chance that my bike will end up on the bottom of a big heavy pile or that it will cross paths with a FedEx employee who is having a bad day. I could have certainly packed my bike more carefully and I hope I don’t regret not taking every precaution. For now, I’m just hanging on to hope! We’ll let you know whether these tactics worked when we pick up our bikes in a couple weeks!